New vs. backlist: 39% of the books I read (22 total) were books published in 2018 vs. 61% (34 books) published prior to 2018. Fiction vs. non-fiction: This was another big year for fiction (no surprise) with 93% (52 books) fiction books read and only 7% (4 books) non-fiction. Author genders: This one is a bit complicated because some books I read had multiple authors, but 93% of the books I read had at least one female-identifying author. I only read 4 books where the only author was a male-identifying author. I feel like usually this is a more balanced split, but this year I just didn’t find very many books written by men that I wanted to read. Go figure. Book format: This was a much bigger than usual year for audio because I had an eye issue earlier in the year that made it frustrating to try to read. So, I listened to 20% of the books I read this year (11 total). Ebooks made up 73% of my reading (41 books), and print was only 7% (4 books). AOC: 43% of the books I read (24 books total) were written by an “author of color” (aka one that does not identify as “white”). I am very proud of this stat. That’s the closest to 50% that I’ve been since I started keeping track of this stuff, and I didn’t even do it on purpose this year. It just happened. I love that! LGBTQA: This stat, on the other hand, was less great. I’m not doing a fantastic job of including queer representation in my reading. Please note, I’m not always sure how an author identifies, and I don’t think that I need to be. That said, I think only 13% of the books I read (7 total) were written by an author who I knew identified as something other than “straight.” This is another reason why I’m excited about the 2019 Read Harder Challenge. Several of the tasks are LQBTQA related, and I’m hoping that helps me “Read Harder” in this personal blind-spot. Of the 56 books I read in 2018, 57% (32 total) were borrowed from the library. That might seem like a good thing, and it would be a good thing, if I’d actually managed to not purchase any books in 2018, or if I’d at least purchased fewer books than what I’d read off my backlog of purchased books. But, alas, ebook sales are kryptonite for me, and there were a lot of 2018 new releases by authors I love. The end result was that I bought 37 books on Kindle in 2018. That’s down from pervious years (see chart below). And, I also managed to keep my cost per book down, despite those new release pre-orders. I don’t mind spending money on books. It’s pretty much the only money I spend on entertainment. The problem is, I feel like if I’m buying them, I should read them. In 2018, I only read 20 of the books that I’d purchased for Kindle. 10 were books I’d purchased in previous years. The other 10 were ones I’d purchased in 2018. But, remember, I purchased 37 books in 2018. So, that means I didn’t read everything I bought, and the additional purchases negated the small dent I’d managed to make in the backlog of books bought in previous years. Keep in mind, we’re just talking about ebooks here. I also have unread print books that were given to me as gifts or ones that I’d purchased as part of a subscription box. Since I’m less inclined to run out and buy a print book that I’m not going to read right away (see comment about ebook sales, above), I don’t really track unread print books. I use my bookshelf as a visual reminder of those. The Kindle books, on the other hand, just seem to disappear onto my Kindle until I remember I bought them, or check my list. This is why one of my reading goals for 2019 is to read more books than I buy. I’m starting 2019 with at least 124 unread books on my Kindle. I say “at least” because there are books on there that I received for free and ones that I might have missed from before I started keeping track and ones that I bought for my husband back when we were sharing a Kindle account. It’s complicated. For example, my “tbr-Kindle” shelf on Goodreads says that I have 148 books unread. That’s probably more like the actual number. But, for the purposes of this exercise, I’m going to go with 124 books because that’s what’s on the list in my book buying spreadsheet. As I mentioned in my 2019 reading goals post, the rule this year is that for every book that I buy, at least one book has to be read so that I end the year with no more than 124 books on that list. Now, ideally I’d read at least two books for every one book that I buy (one being the book I bought, plus another book from the backlog). But, this year I’ll be satisfied as long as that number stays flat. To keep myself honest, in my monthly reading recap posts this year, I’m planning to do an accounting of books added (inbox) vs. books finished (outbox). We’ll see how it goes. If you stuck with this post all the way to the end then you must be a kindred spirit who loves to geek out on data! Or you’re my mom. Either way, hi, friend! Thanks for reading and appreciating the annual combination of my love of reading with my love of spreadsheets and data. If somehow you got this far and are not already tracking your own reading but think you might want to start, I highly recommend using a spreadsheet like the one provided in this post on Book Riot. It’s pretty thorough, and they set up all the formulas and charts for you. So, if you don’t love spreadsheets and formulas as much as I do, you don’t have to worry about that part. Okay, data geek-out is over. Time to get back to working on writing and editing my books! Happy reading! One of these years I will remember that after a month of writing (aka NaNoWriMo), I need to take a break to read and recharge. That ended up being the theme of my December. I didn’t get much writing done, but I did a lot of reading. I started off the month with Light Years by Kass Morgan and Muse of Nightmares by Laini Taylor, two entirely different books. Light Years is a fun YA sci-fi novel told from the perspectives of a mixed cast of characters. I liked it, but I didn’t love it. I wanted to love it because it had so many elements of sci-fi stories that I love. What I did love was Muse of Nightmares. It was an excellent companion novel to Strange the Dreamer. I love Laini Taylor’s writing style. Her descriptions are delicious without being over-the-top flowery, and she writes great angsty love stories. 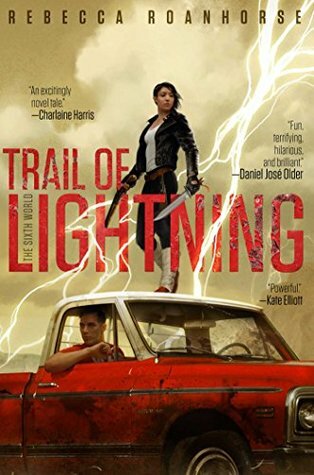 After that, I picked up Trail of Lightning by Rebecca Roanhorse. I’d been really looking forward to reading this book, but I’d forgotten that I’m not a huge fan of urban fantasy. If you are a huge fan of urban fantasy, you really need to read this book. I loved the world-building. It’s very well thought out, and the backstory of why things are the way they are is woven into the story nicely. I really liked it, but it’s not really my favorite genre, so I’m not sure if I’ll keep going with the series. After I “finished my coursework” (aka Trail of Lightning), I “helped Hagrid decorate the trees” by reading Jane Doe by Victoria Helen Stone. Saying there is gold on the cover of this book is a bit of a stretch. But, of the books I wanted to read next, this was the only book with something like gold on the cover. Also, the only thing magical about this book was how well the author captured the first-person voice of this female psychopath. So good. Also super disturbing. If you’ve ever been in a verbally abusive relationship, this book may be triggering for you. But, it’s so good. My friend (who also read this) and I want to subtly give this to everyone we know who might be in, or might find themselves in, a bad relationship. After I recovered from that adventure, I “visited the Three Broomsticks for mulled pixie wine” by reading Night Flower by Kate Elliott. As you may remember, I listened to the Court of Fives series on audiobook earlier this year and loved it. Reading the novella was a trip because I hadn’t seen any of the names in print before, but knew how to pronounce them all because of the audiobooks. It’s usually the opposite for me. As for the story, it was a nice addition to the series. Not critical to read, but added some context and world-building beyond what was in the books. The “mulled pixie wine” must have gone to my head because I forgot that I was supposed to “sneak into the kitchen to gift Dobby socks” next. I had a few novellas and short novels with clothing on the cover, but I wasn’t sure which book I wanted to pick, and I knew what I was reading for the next task. I’m bummed I missed this one because giving socks to Dobby was possibly my favorite task on the chart. After all, I’d tried to pick the path I would most likely have taken if these were actual things I was doing at Hogwarts for Christmas, and this was one thing I would *definitely* have done. Instead, I got ahead of myself and “put on my knitted sweater from Molly Weasley” by reading the other novella in the Court of Fives series, Bright Thrones by Kate Elliott. Again, this is non-critical to understanding the series of books, but does give more insight into what happened with Jess’s twin sister. One of the things I loved about this series was how it really did have that sense of family and included present parents in the story. That’s not something you find a lot in YA fantasy novels, and it’s why I felt like this was the perfect pick for this task. After Boxing Day, we went down to Portland for a short visit with our friends, and I didn’t finish any more books. There was much game playing, but no reading (at none done least by me) until I got home. I did start a few books in the last two days of the year with no intention of finishing them before January first. That’s so unlike me. I usually like to have everything all wrapped up nice and tidy by the end of the year. Not this year. One of the books I started was The Bullet Journal Method, which was waiting for me in my mailbox when I got home. The other was The Power of Habit, which I’ve been hearing a LOT about and decided to finally try. Both of these were excellent choices to start off the year, as far as I’m concerned. As for my first fiction read of 2019, I picked Planetside by Michael Mammy. I started reading it on January first, and I’m only about 25% through it, but I’m really enjoying it. It’s reminding me how much I miss reading military sci-fi. We’ll see how many of these I manage to finish before the end of this month… But first, it’s time to crunch the numbers on my 2018 reading stats. That post should be up tomorrow. In the meantime, let me know in the comments what you picked for your first book of 2019. Powell’s just released their Staff Top 5 Picks of 2018! As I did last year (and in 2016, and 2015), I’ve crunched the numbers* in order to calculate which books were most mentioned and determine a “consensus” top ten list. The Alehouse at the End of the World by Stevan Allred (fantasy) — This was the clear winner with 18 total points and was mentioned by five of the staff in their lists, but somehow I never heard of it before I saw it here. I immediately clicked over to my library to reserve a copy, but they don’t have it. I have library cards at three different libraries, and none of them had it (or at least not on digital). So, I requested they go buy it, and I moved on to the next on the list. Heart Berries by Terese Marie Mailhot (memoir) — I don’t usually read memoirs. But, when I read the description and saw that it was about a woman growing up on Seabird Island Indian Reservation in the Pacific Northwest, I read the glowing reviews and saw it was a really short book. So, I looked it up and found out that my local library had this one available for digital loan. Then I borrowed it. It’s now on my Kindle. Educated by Tara Westover (memoir) — This wasn’t only a popular staff pick, but it was also included on their “picks of the season” gift buying list. Again, this is a memoir, so not my usual jam. But…the description intrigued me. A woman who was born in rural Idaho with no birth certificate but then later left that life. I was interested enough to go add this to my holds list as well. There There by Tommy Orange (lit fic) — This is a novel written by a Native man and takes place in Oakland. The sheer amount of glowing reviews, blurbs, and best of lists that are mentioned on the page for this book make it hard to find the book description. Apparently, it’s really good. So, I decided I’d better check it out (from the library) and added it to my hold list. Circe by Madeline Miller (fantasy) — Finally! One that was already on my “to-read” list. I haven’t read her Achilles book. I’ve heard enough good stuff about this book that I decided I’m just going to read this first. Since I already had my library Overdrive open, I clicked over and added this to my hold list as well. Red Clocks by Leni Zumas (spec fic) — This is a near-future speculative fiction book that sounds like it would be a big hit with fans of Margaret Atwood, especially the ones who enjoyed The Handmaid’s Tale. That includes me, so I figured I should probably add it to my hold list as well. I couldn’t figure out why I hadn’t heard of this book, but I think it may be due to the fact that, assuming I saw it at my local bookstore, the cover and title gave no clue about what this book is about. Marketing fail. Heavy by Kiese Laymon (memoir) — It seems that the staff at Powells like memoirs. I thought I’d finally found one that maybe I wasn’t interested in reading. But, this is one of those books written by and about a life and experience very unlike my own. So of course I had to add it to my holds list. I’ll Be Gone in the Dark by Michelle McNamara (true crime) — This is one of those serial killer true crime books that should never ever end up on my to-read list. Even the reviews say it’s super scary. But, by this point in the list, I’d committed myself to reading all of them. So, now it’s on my Kindle (there wasn’t a wait list for the hold at my library). I’m going to need to read this alongside something a lot fluffier. And in daylight, surrounded by other people. Washington Black by Esi Edugyan (lit fic) — The description of this book sounded almost like a cross between The Signature of All Things and Homegoing. I really enjoyed both of those books, so this got added to my holds list as well. The Third Hotel by Laura van den Berg (lit fic) — This one’s a novel with an interesting premise. Grieving widow goes to Havana after her husband dies in a car accident, then she sees him at a museum. See? Interesting, right? By the time I’d got to this book, I’d already maxed out the available holds at my local library. So I had to put this one on hold at a different library. When I started crunching the numbers for this post, I definitely did not think I was going to walk away with ten new books on my library hold list. The only thing I can attribute this to is the fact that I haven’t been reading much “lit fic” or non-fiction, lately. I think maybe my brain is searching for new material to chew on. Whatever it is, I’m going to go with it and see where it leads. I try to avoid trash talking the publishing industry, but I have to say that nothing about the covers (or titles) for any of these books would have made me pick them up in a bookstore. I wander through my local bookstore almost weekly, and I’ve probably walked past most, if not all, of these books *many* times. Maybe I’ve spent too long immersed in the romance and sci-fi / fantasy genres where everyone is all about the covers and the titles. But, it seems like the non-fiction and lit fic folks have never heard of #bookstagram. Seriously, if these books are really as good as the staff at Powells thinks they are, then I think maybe the non-fiction and literary fiction arms of the publishing houses may need to up their marketing game. I have Goodreads friends (and IRL friends) who read these sorts of books more than I do and only half (five) of these books had been added to any of their shelves. And only two of those books (Educated and Circe) had actually been read by any of my Goodreads friends. That’s really unfortunate for these authors. * In case you’re interested, here’s how I came up with the total points… I did some good old “copying and pasting” of all the lists into a spreadsheet. Then I assigned points to each mention of each book based on where it appeared in each list (5 points for first place, 4 points for second place, etc.). Then I made a pivot table and sorted the results by total number of points in descending order. There was an obvious cut-off after the first ten books. So I capped the list at ten books. Happy New Year, everyone! I took a little time off over the holiday to rest and recharge. I read a bunch of good books and had fun times with family and friends. Now I’m ready to start 2019! I hope you all had a happy New Year and a fun and relaxing holiday, too! Today’s Top 5 Wednesday theme is “2019 reading resolutions.” I was planning to post my 2018 reading summary before I did my reading resolutions, but I didn’t get that done yesterday. So, we’re going to do this a bit out of order. Today you’ll get my 2019 reading goals, and later this week I’ll post my December reading summary and 2018 reading stats. Oh! And Powell’s posted their staff Top 5 lists! So, my summary post is in progress. I’ve already crunched the numbers and reserved the entire list at my library. Spoiler: there are a LOT of good books that weren’t on my radar. In case you have no idea what I’m talking about, check out last year’s post. As for my “2019 reading resolutions,” I’m not really a fan of making “resolutions,” but I’ve definitely have some reading goals for 2019 (as I do every year). I never thought this was an odd thing to do until last week when I was talking with friends and they all looked at me funny when I asked about their reading goals for 2019. Apparently, not all avid readers make reading goals. Who knew? My reading goals are pretty much the same every year: read at least 50 books (about a book a week, on average) and try to read diversely (books by AOC, different genres and age ranges, books by or about folks with different experiences than me, etc.). This year I’m adding a few other goals to that list, and not just because I wanted to round it up to make a “top five” list, I swear. I actually had a few more goals than the ones listed here, but I trimmed things back to keep focused, reduce overlap, and limit myself to only five. Read an average of a book a week for a total of 52 books read in 2019. — I’m increasing my usual goal by two books to make it an actual average of a book a week. I almost always exceed this goal, so adding two more books shouldn’t be an issue. Create one page in my bullet journal for every book I read, once I start reading it, to write down thoughts and notes about that book. — I’ve stopped writing reviews on Goodreads and only leave star ratings these days. On my blog, I only mention high-level thoughts in my monthly reading recap posts. Mostly, this is because I know how much work goes into writing a book, and I’m not interested in dissecting that work in public. I do think it’s useful to read critically and make notes about what I enjoyed, what I didn’t, and why, as well as what I learned (from a craft perspective, if I’m reading fiction). So, at the end of last year, I started capturing these thoughts in my notebook. The added benefit is that it’s much easier to reference these notes. Attempt to complete all the 2019 Read Harder tasks and try to do it using books that are already in my TBR (physical or virtual) wherever possible. — This one is sort of two goals wrapped in one. I don’t have any specific reading diversity goals I’m trying to hit this year, and I liked the ones on the Read Harder challenge because there were plenty that represent new areas of reading for me. But, I also have over 100 books unread on my Kindle, plus an entire shelf of unread print books on my bookcase. So, before I go running out to reserve a book at the library to cover one of these tasks, I’m going to see if I have any purchased and unread books that I could read to check off a task, instead. Read more indie published books. — When I decided to self-publish my Modern Fae series, I hadn’t read a lot of indie-published books, but I had talked with a lot of indie-published authors and watched a lot of indie-authors talk about publishing on YouTube and at RWA events and conferences. This year, I’d like to try to expand my reading beyond the mainstream popular traditional published stuff and read more books by indie-authors. Coincidentally, this is also a task on the 2019 Read Harder challenge. Read more books that I own than the amount that I buy for myself. — This is one I’ve been working on for the past few years. You’ll see when I post my 2018 reading stats that I did a great job of buying fewer books this year. The problem is, I read a LOT from the library this year. So, net effect is that I added books to my “purchased and unread” books. This year, I want to try to keep the number of books on that list at neutral, or hopefully reduce it. My plan is to only buy books if I can’t get them from the library *and* I plan to read them immediately. All this requires tracking, so I’ve added some new spreads in my bullet journal. This first one I’ve already added to a previous post. I’m using this to track new releases and the Read Harder tasks. I also mentioned in a previous post that I’ve been frustrated with how many places I’m tracking what I’m reading. This year, I’ve decided to narrow things down as much as possible. I’m going to use Goodreads to keep track of what books I have in progress and/or checked out from the library. I’ll update Goodreads when I start a new book or when I finish a book. All day to day tracking and book notes are going in my bullet journal. And, I’ve decided to keep using a spreadsheet (I like this one from Book Riot) to keep a list of books and related details about those books because it makes it easier for me to run my reading stats at the end of the year. But, I’m probably only going to update it once a month or so because I only check my stats every six months. That should take some of the pressure off. That’s the plan, and I’m pretty excited about it. So, how about you? Do you have reading goals or resolutions? Do you track your reading stats in a spreadsheet like the one from Book Riot? Tell me about it in the comments. Happy New Year! Wishing you all the best for 2019! Ten tropes I am trash for…paired with book I just read or want to read! Ah, tropes, those time-tested story elements that keep popping up over and over again. You know, like the much-discussed love triangle. Some people love them. Some people hate them. But, they’re definitely not going away anytime soon, and that’s fine by me. Tropes are a little like favorite foods, every reader has ones that make their mouth water, but they’re different for everyone. Find someone who loves a particular trope, and you’re bound to find another who doesn’t like it, or who avoids it entirely. I’m of the opinion that the only “bad” tropes are the ones that perpetuate harmful representation. Other than those, I’m here for all tropes, especially a trope done well, or done in a unique way. But, the ones I’ve listed below are my favorites. They’re the ones that will get me to one-click a book to my TBR or shopping cart every time. Masked balls —This is a tropey plot point that I’m all in for, no matter how corney and obvious it may be. If the hero and the heroine have to attend a masked ball, you can expect there will be fireworks and mistaken identity and yearning. I love it. One of my favorites is the one at the heart of The Daughter of Smoke and Bone series. It’s so delicious and angsty, featuring the perfect pair of star-crossed lovers. One last job, especially a heist — Getting the gang back together is one of my favorite tropes. I love a good ensemble cast, especially one with tensions from years of working together, and hopefully a good romance thrown in as well. I loved the movie Ocean’s Eight. I need to find more books like that. Especially ones with an all lady, or mostly lady, crew. Along those lines, I recently read and enjoyed Seafire by Natalie Parker. It features an all lady pirate crew out to destroy the awful tyrant in charge of their world. There’s also a nice enemies to lovers romance that starts sizzling when the Captain of the crew allows a boy onto her ship. Just beware of the cliffhanger ending. It’s the first in a series, and book two isn’t out, yet. Female spies and assassins — Think “female James Bond” or La Femme Nikita (specifically, the Luc Besson movie from 1991). If a novel features a female spy or assassin, my ears perk up and my fingers start clicking. Earlier this year, I heard mention of The Spymaster’s Lady by Joanna Bourne in a podcast and immediately borrowed it from my library. It’s so good. If this is your catnip, too, you should definitely check out that book and the rest of the series. Found family — Oh how I love a found family. This goes along with my love of a good ensemble cast. When it’s a rag-tag group of misfits thrown together on a spaceship or to embark on a fantasy quest, I can’t resist. A series that I finished recently and loved for this very reason is the Illuminae Files series. There are three books. Each one features a different setting and romantic pairing, all in the same world focused on different vantage points of an event that happens in the first book. In the last book, each pairing and their found family comes together to make for one big crew. It’s glorious. Just be sure to get it in paperback or hardcover because the interior layout is best viewed on paper, in my opinion. Dancers and men who can dance — I’m especially susceptible to any book featuring ballet and/or hip hop dancers (think Step Up vibes), but ballroom dancing is equally athletic and hot. Recently, I’ve been digging Alexis Daria’s “Dance Off” series, starting with Take the Lead. I’ve got the next book queued up in my library holds, and I’m very excited about it. Suddenly royal — If a book has a hero or heroine who thinks they’re no big deal only to find out that they are actually royalty, I’m in. This also applies to a hero or heroine falling for royalty and becoming royal that way. Most recently, I’ve loved A Princess in Theory and A Duke by Default, both by Alyssa Cole. Jane Austen retellings — It doesn’t matter the genre, I can’t resist a Jane Austen retelling. It’s been a while since I’ve stumbled across one that I particularly enjoyed. There are several out right now that I have on my TBR, but the one I have my eye on most isn’t coming out until February 2020! That’s The Stars We Steal by Alexa Donne, and it’s being billed as “Jane Austen meets The Bachelor in space.” It sounds delightful. Elite military academy, especially if it’s in space — The fastest way to make me click “buy it now” is to tell me there’s a military space fleet academy involved. I blame this on my favorite, and criminally under-appreciated, Anne McCaffrey novel, Sassinak. It’s difficult to find books with this trope that also include a strong romance plot, but many of my favorites include romantic subplots, including the book I just finished reading, Light Years by Kass Morgan. I hope I didn’t do too much damage to your TBR with all these recommendations! Feel free to return the favor and let me know your favorite examples of these tropes that I should definitely add to my wish list. I’m a little late to the party on this one, but I’m thinking about jumping into the “Christmas at Hogwarts” Magical Readathon, going on now. It started on the 17th and goes through the 26th. I’ve decided that, since we’ll have family in town for the holidays, and since I deserve a bit of a break after yesterday’s book launch, I’m going to take some time off from writing to enjoy the holidays and some good books! The task sheet for this readathon is part of what hooked me. It’s super creative and modeled after the Marauder’s Map. Honestly, how can I resist? She’s even made versions in different colors (check out the video linked above for those), but I like the parchment style best. I am currently (and have been since the 17th) working on finishing Trail of Lightning by Rebecca Roanhorse. So, that’s going to be my “finish your coursework” book. Then, I think I’m going to “help Hagrid decorate the trees” by reading a book with gold on the cover. I think there’s enough golden hair on the cover of this one to make it count, right? 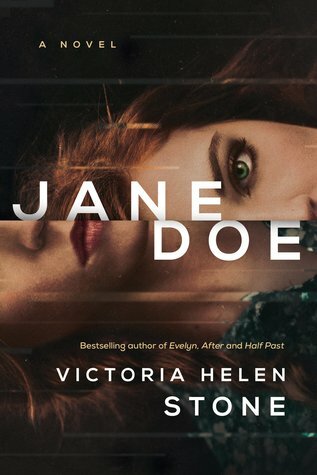 Can we agree that Jane Doe by Victoria Helen Stone counts? Please? Because I really want to read this next… I have more planned, but I’ll keep those to myself for the moment and post when/if I manage to finish these two. Definitely let me know if you’re participating, and tell me what you’re reading in the comments. Happy holidays and happy reading! Eve of the Fae on sale for limited time! Just in case you were waiting to grab a copy of my book when it went on sale, now’s your chance! Eve of the Fae is available for $1.99 for a limited time, as part of a Kobo promotion event! I’m also matching the Kobo price on Amazon. So, grab a copy on Amazon or Kobo, and get caught up before the prequel novella drops on Tuesday!